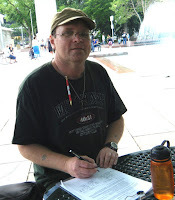 June Civil Information Actions Tops 500 Plus Petitions "Canadians Say INVESTIGATE 9/11"
On June 28, 2011 Garth Oxton's signature became Edmonton's 501st signature collected since the first 3 signature from the start that included Dr Niels Harrit, Professor Anthony J. Hall and Captain Bruce Sinclair back in February 22nd. Almost all signatures were collected by one lone activist working the streets of Edmonton streets using the highly successful civil information activism as his tool of choice. Doug alone managed to break the record of 500 in 5 months compared to the 2008 Vancouver truth bus cross Canada petition drive also which Edmonton911Truth participated too. The reason for this success Doug explains is more and more people are better informed to the unanswered questions surrounding the events of 9/11 including world trade center 7, that was not hit by a plane, but collapsed at free-fall speed like the first two towers.